Under President Obama the US was caught in a backwards spiral. Unemployment rose to as much as 10% while the amount of US debt doubled to nearly $20 trillion. In spite of the government not being able to pay its current bills, Obama’s US took on more and more third world immigrants and opened its porous borders with Mexico. Jobs were sent overseas with the help of horrible trade treaties with other countries. The Middle East turned upside down as US troops were pulled from Iraq and guns from Libya were supplied to rebels in Syria who morphed into Islamic killers. Americans murdered in Benghazi were ignored and patriot taxpayers who supported conservative principles were repressed. All the while the complicit mainstream media (MSM) supported Obama’s destruction of America and condemned all who dared stand up for justice. These efforts to destroy America are what led to the Trump Presidency. But liberals never got it. They performed studies after the election and rightly learned that their old legacy compliant media was no longer the only show in town. Entities like this site (TGP) were sharing the real news and their messages were shared on the mega news site – the Drudge Report. Hillary was sick and taking time off from her campaign. Podesta’s emails were released by WikiLeaks, and although the MSM wouldn’t report what was in them, the criminal and corrupt actions of Hillary’s campaign manager and former Bill Clinton and Barack Obama aide, showed corruption at levels never seen before. These too were reported by the ‘new media’. So after the election did liberals decide to change their ways? Did they see that their policies were wrong for America? Did the MSM decide to change its ways and start reporting honest news? Instead the media continues to dig deeper ditches, to support the fake news that they have been behind for decades. Fake news stories like Hillary is great, Russia stole the election for Trump, and any negative bit of information, whether true or not, is blasted throughout the MSM. But more subtle and sinister is what is not reported by the MSM. The stock market is on fire and this is the best year in the history of the Dow. Unemployment is lower than we have seen in more than a decade. The Debt to GDP ratio is down under President Trump. Foreign countries respect America again. Trump is Making America Great Again. But this all goes unreported by the MSM. In addition to the MSM’s desire to manipulate the news and damage President Trump, liberals led by Media Matters are behind the scenes attempting to destroy free speech in America. This was laid out in a game plan by Media Matters after the election. They felt erroneously that they lost the election because their message was not shared with more people. This led to their attempts to totally shut down free speech. Media Matters is leading the Liberal assault on all conservative speech on any medium today. Media Matters celebrates the destruction of free speech in America that the founders intended for all Americans. Yesterday Sean Hannity unleashed on “fake news CNN” Sunday after CNN’s Brian Stelter gave an interview to Soros-backed Angelo Carusone, the corrupt, homophobic president of Media Matters. Hannity went on an epic tweetstorm slamming fake news CNN, Media Matters and embattled CNN president Zucker, warning ‘tick tock’. But Hannity is not the only one under attack. Media Matters was behind the top cable news network star, Bill O’Reilly’s firing from FOX. The Media Matters hacks hire people to send nasty emails to companies encouraging them to not advertise with conservatives based on lies and falsehoods. They are working with Facebook and Twitter to stop the spread of conservative free speech by instituting programs where Facebook and Twitter determine what speech can be shared and what cannot. They call this their campaign to weed out ‘fake news’ but this is just a fraud for conspiring against the 1st amendment. It’s just the opposite as Americans see through the liberal spittle for what it is. 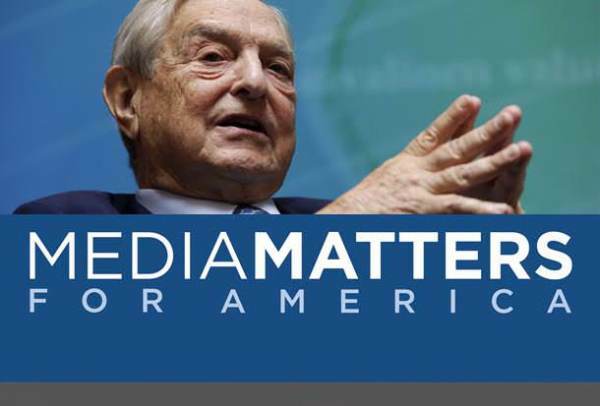 Media Matters believes that if they institute the Nazi practices that Soros sympathizes with to stop the spread of free speech that they can get someone like Hillary elected as President. Then they can continue their destruction of America and American values. But they are wrong. No matter what Soros and Media Matters do to destroy America, Americans will overcome and vote in great leaders like President Trump and will continue to make America the beacon of hope around the world in the decades to come. Entities like TGP will continue to spread conservative truth and bring to light media lies and skunks like Media Matters.